To start, we will make the custom part of the custom card holder. In your word program draw a square that measures 5" x 4". 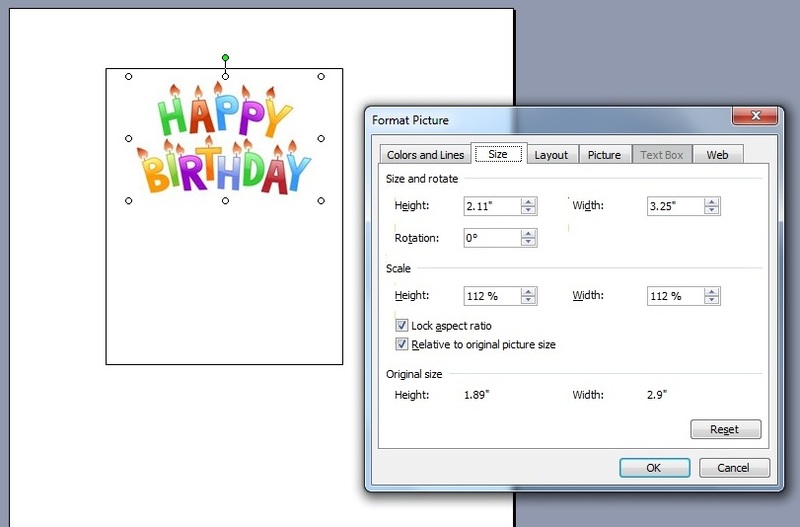 Now add your desired custom image. 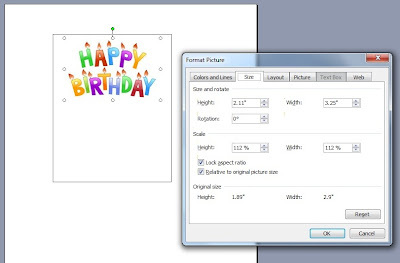 You can add names, use images, just customize it for you. Be sure your image is around 2" x 3.25". Place it at the top center of your square. Now trim along the lines. 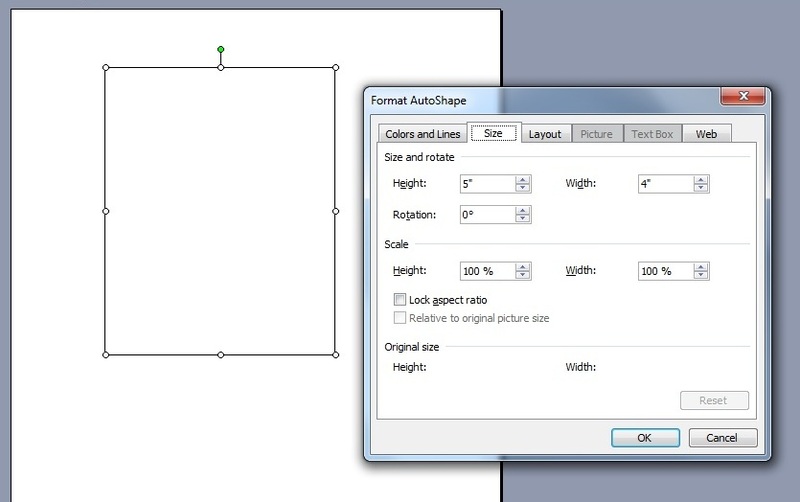 Your printed fabric will now measure 5" x 4". This will be used for the inside fabric of your card holder. Now, to trim up the rest of your pieces. Trim a piece of batting to 5" x 4". 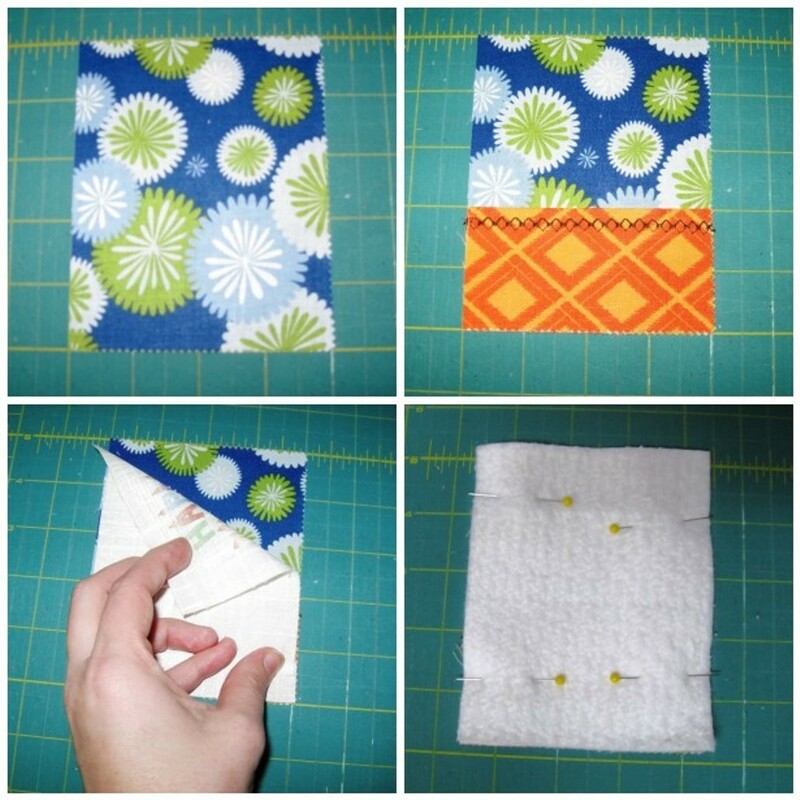 Trim the fabric you want to use at the outside of your card holder to 5" x 4" and trim the fabric you want to use as your pocket to 4" x 4". 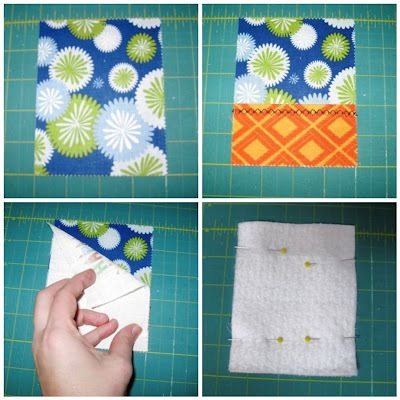 Fold your pocket piece of fabric in half and then stitch a line about 1/4" down from the fold. You can do a decorative stitch or a straight stitch. Whatever you like. Now you are ready to layer your pieces. Start by laying your outside fabric with right side up. Then lay your pocket with the fold toward the center and right side down. Now lay your inside fabric (the printed one) onto your stack with right side down. Be sure that the printed part is opposite of the pocket. Lastly, layer your cotton batting and then pin through all of the layers. Now, cut your elastic in half. Loop the half and place the looped end into your layers between the outside fabric and pocket fabric. Pin your elastic in place. Stitch around your layered pieces leaving an opening for turning. Be sure to back stitch at the start and finish. Trim the 4 corners and the excess elastic. Turn right side out through the hole and use a pointed tool to press out the corners. Give the whole thing a good pressing and then hand stitch the opening closed. Now just to add the button. 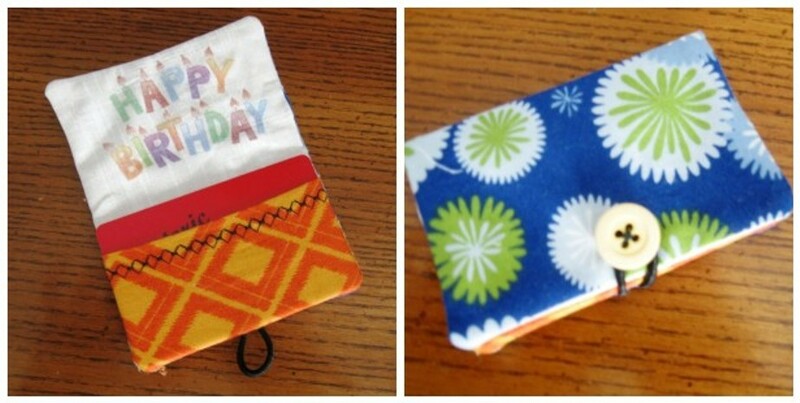 Fold your card holder in half and pull up the elastic. Mark where the loop sits. Now just sew your button onto the making being sure to only go through one layer of fabric. And your done. 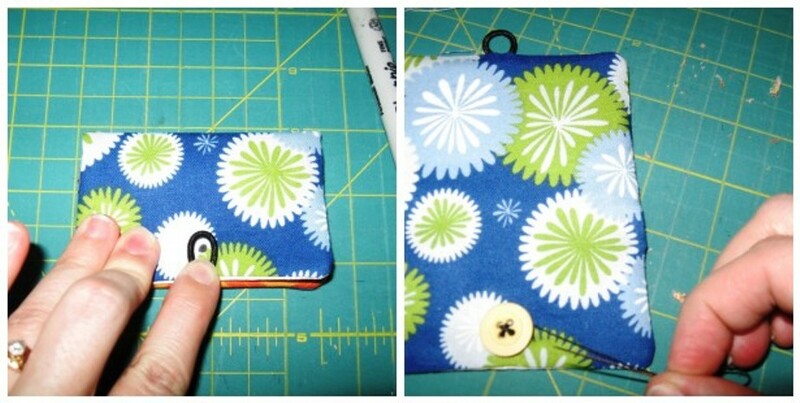 One adorable custom card holder. 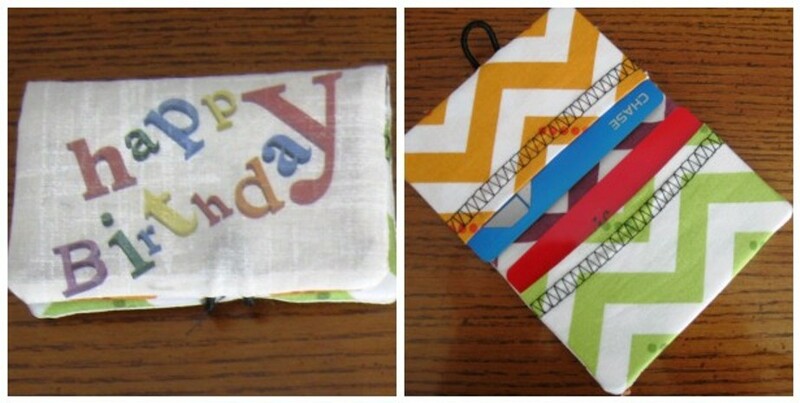 This next card holder has your printed fabric on the outside and 2 pockets. It follows the exact same steps with just a few little differences. Now just layer it up the same way. You will notice the pocket is a little larger. After stitching and turning right side out you are ready to add the button. This is easiest if you add a card first. Now fold over the top. You will notice it doesn't fold all the way over. Mark the button the same way and stitch it in place. And another cute option that looks like a cute little envelope card holder. If you get really into making these, you can always try to throw a little quilting into it. 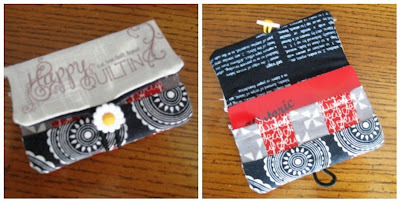 This one, that I made for my business cards, I decided to throw in a little quilting. Just decide what options you want to use and then piece your fabrics to that size. It's easiest just to make it large and then square down. I decided to do the label so that it folds over onto the top of the envelope. So when you you layer, be sure to put the pocket on the opposite side of the printing. And that's it!! I hope you enjoy this tutorial. If you whip up some of your own Custom Card Holder's you can add photo's to my Inspired by Happy Quilting flickr group. I would love to see your creations!! So get your handmade custom card holder sewing on and Happy Quilting!! wow! so many excellent ideas! i love the custom printing one and the double pocket. perfect timing too for all of the Christmas gift cards coming up. thanks! These are really cute. Thank you for this tutorial. 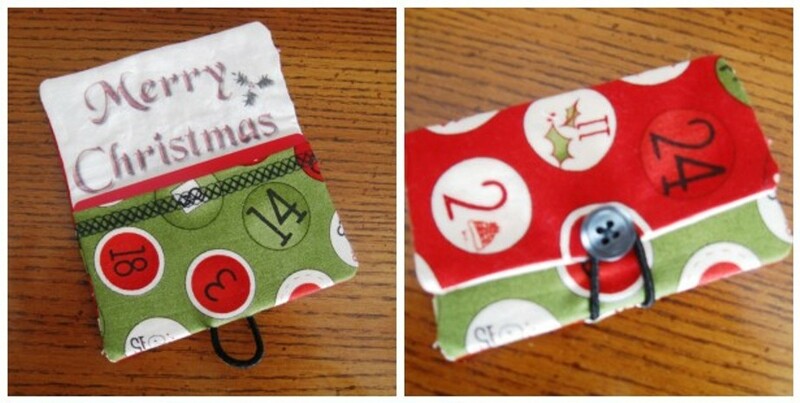 I am going to make one to hold my driver's license and insurance card since I don not carry a purse. I love that you customized them by printing out your own label! Perfect for giving gift cards! Does the ink come off in the wash??? 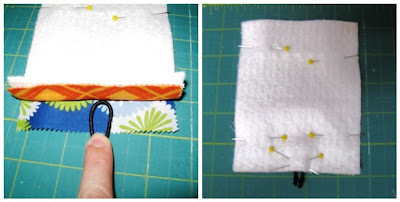 I was thinking I could use this method to make labels for my quilts....whats your thought??? Cute, cute idea. I just learned recently that you could adhere fabric to freezer paper and run it through your printer, so much less expensive than buying the ones in the quilt shops. Thanks for the link to your tutorial. Also when it comes to writing on quilt labels I also just learned that you can use gel pens for handwriting and they don't fade or run. I tried it on a test label after heat setting it and when I put it in water it didn't run. Very cute, Melissa! You are so talented!!!! wow! so many excellent ideas! I wish i could use this method easily.